I was both aghast and tantalized with how the author pulled off describing her experience in butchery and sharing her views about meat processing and meat consumption. This book transformed me - I’m still a meat eater but it has made me curious about the meat handling process and it has made me care about where my food comes from. Review copy provided by the publisher. EAT, PRAY, LOVE, only this time 1) in France 2) with meat, and (3) an extra helping of self-absorption. Formidable! What an awesome read! 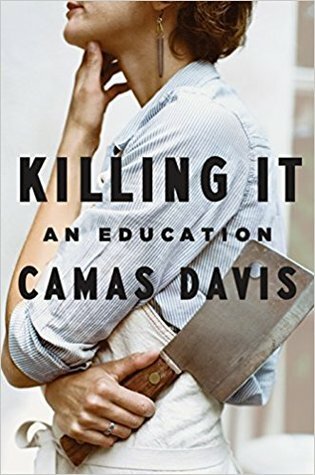 Fascinating and sincere, Camas Davis will make you question where our meat comes from and, at the same time, make you want to learn how to butcher a pigs head and make pate de tete. Read this book as soon as you can get your hands on it. You will not be disappointed. I really enjoyed this book! Being an animal science major I’ve taken a meat class and we had to observe and help with a pig, cow, and lamb slaughter. The details in the book are spot on and true. It reminded me to respect where our food comes from and that it can be humanely done! A thoughtful consideration of the carnivorous diet approached by a curious mind, "Killing It" takes the reader along on the author's unexpected journey with honesty and wit.